This author had several small feelings of slight dizziness, eyes not focusing clearly, and feeling sick. He would drink some water, take deep breaths and ly down for about half an hour; and his feeling slightly dizzy would go away. He was back to normal again. While such symptoms occurred about once every three months, he would ignore them as he was not aware that these symptoms may be related to vision and hearing, and possibly vertigo. But one day in early 2019, about noon, strange head sensations appeared and I sat down in my work desk. I was somewhat confused and decided to find out if the strange sensations would go away. While sitting for about 5 minutes and I felt sick, I wondered if this may be a stroke. So my wife and I decided to call 911 and the medical ambulence team rushed me to the hospital. I felt sick, vomited and had lost my balance and muscular strength. While in the hospital, the doctors ran all the Lab standard blood tests, CT-scan, MRI and ultr-scan test on carotoid arteries that the attending neurologist used to verify that, indeed, I had experienced a vertigo. Upon reviewing my medical tests and history the neurologist discharged me on the second day and I went home. Having been home for almost a month I have regained most of my normal way of life. I can walk slowly without a cane or walker, as before; although I use the cane as a more secure balance helper. My experience of having a vertigo episode and not recognizing it as such may be typical for millions who feel dizziness and confusion but who do not relate it to vertigo and do not visit their doctor. The otoconia or otoliths or crystals [pink color] sit on top of tiny hairs [ orange/yellow color] that are covered by fluid [light blue color] in the inner ear cochlea. When you move the head, the crystals keep their position and move with the hairs. The ear communicates with the eyes in the brain to give you normal vision, hearing and balance. But when some crystals become detached and float elsewhere, then you may feel dizzyness, lose your balance and become disoriented. By Betty Foster, MD, Causes of vertigo; What is vertigo? Length=4:37 mns. If you have vertigo, you might feel like you are moving or spinning when you’re not. Or you may feel like your surroundings are in motion when they aren’t. Wiki: Vertigo McGill: Vertigo 2017 Markus McGill views vertigo as "Vertigo can be a symptom of other conditions, and it can also have its own set of related symptoms. These include: balance problems; lack of strength; sudden movement of head or body; lightheadedness; a sense of motion sickness; nausea; vomiting; tinnitus; a feeling of fullness in the ear; disorientation and possible headache." Vertigo is not just a general feeling of faintness. It is a rotational dizziness. Cause: Vertigo is complex and what triggers vertigo is seldom known. Vertigo is neurologically linked to the eyes, ears and nose area, although the cause may be related to other body functions, like leaky gut, toxic street drugs, medications, coffee, smoking, alcholic beverages, environmental pollution, motion sickness, bad diet, computer radiation, stress and chronic diseases. The real cause of many episodes of vertigo are often interrelated, hence finding the initial trigger that causes vertigo may be hidden and unknown. Dealing with a vertigo experience: " Avoid quick change in head position or sudden moves; Sit still during a vertigo attack; Get up slowly if lying down or seated; Avoid bright screens or flashing lights during a vertigo attack; Use low-light rather than darkness or bright lights. Exercises for vertigo: There are many good suggestions on how to deal with vertigo. Below are several U-tube videos that show how to do it. Vertigo exercises offer one form of treatment to dispel these disorienting symptoms. By Fauquier ENT; Inner Ear Balance Home Exercises to Treat Dizziness; 11/19/2017 Length = 5:25 mns. By Live Healthy Life; How to Stop Vertigo Fast 7/15/2016; Length 2:12 mns. Getting rid of toxins: Toxins accumulate in joints and can interfere with body processes. Although research is lacking to support the idea that accumulation of toxins may trigger vertigo, toxins may be a contributory cause. Most persons are not aware that the body has the ability to detoxify. But .... there is a secrete! The toxins accumulate in lymph nodes and joints, especially the upper body, near eyes and ears. When the toxins stay in the lumph nodes and joints, these make a person feel sluggish and uncomfortable. Exercise causes the muscles surrounding the lymphatic vessels, acting as a pump, to squeeze the toxins and lumphatic fluid into the veins, then empty into the arteries in the upper chest-neck area and and then move the toxins out into the kidneys as urine. It is important to detoxify all parts of the body and especially the neck and head area to allow the ears and eyes to work properly. Such daily exercise routine should be a part of the exercises for preventing vertigo. There are many scammers on the internet that make numerous claims about vertigo without any evidence to back them up. The classic example is the article by Goodman: Vertigo exercises, who claims that vertigo is caused by three major factors: 1.Pressure on the inner ear (water buildup, in the case of Ménière’s disease, and infection with vestibular neuritis). 2.Lack of blood flow to the brain. Low blood pressure is often blamed for this. But bad blood circulation is a more common cause. This is what often leads to stroke. 3.Miscommunication between the balance system in the ears and eyes. The ears tell you to move in a certain way, and the eyes in another way. That’s why people sometimes fall down when they close their eyes." Goodman claims that : This does three things: 1.It increases blood flow to the head. Most people think the heart is the only source of blood circulation. But all muscles act as mini-pumps that help the heart. The muscles in the neck are especially important to get blood flowing up to the brain. 2.It triggers the lymph system to remove toxins and extra fluids from the head area. It also fights infection in this area. Almost everyone, for example, has stiff jaws. When you begin to loosen up your jaw, it triggers the lymph system around the inner ear (very connected). This is the only reliable way to remove fluid and fight inflammation in the inner ear. 3.These exercises position your head in the right way. If you look in the mirror, I guarantee your head doesn’t sit completely straight on the neck. I never met a person suffering vertigo or dizziness that had his or her head positioned 100% correct. Your neck joints are like a cabinet door with wrongly adjusted hinges. They either bang into the other doors or won’t close properly. This blocks blood flow. But more importantly, it skews the balance between your eyes and ears. Your ears feel like your body is positioned in one way while your eyes perceive your position in a different way. When you work on the muscles around your balance system, your head will be rightly positioned. Your ears and eyes will agree. …therefore, your vertigo will be permanently healed! Goodman's pitch about exercises that cure vertigo sounds good until you come to the end of his advertizement article .... when he asks for a donation to help his cause. Now, his exercises may be good but you don't know what these are and whether these will actually cure vertigo in just 15 minutes! If you search the internet for vertigo, you will find scores of explanations and ways to deal with vertigo; most unverified. Can all these scammers be correct? How Common Is It to Experience Vertigo? Marks: Vertigo information "Vertigo is considered a common symptom. Nearly 40 percent of all adults in the United States experience vertigo at least once during their lifetime, according to the University of California San Francisco Medical Center. 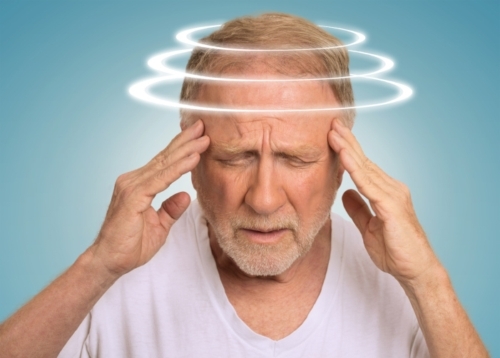 Vertigo is typically more prevalent in older people, but it can affect anyone at any age. Women are slightly more likely to experience vertigo symptoms than men. Other research has shown that about 12.5 million adults over age 65 in the United States have a dizziness or balance issue that significantly interferes with their lives. According to the National Dizzy and Balance Center, there are between 5 million and 8 million doctor’s visits for dizziness in the United States each year, and dizziness is a primary reason for an office visit in people over age 75." Precautions: Anyone who experiences vertigo or other types of dizziness should not drive, operate machinery or use a ladder, because these activities can pose dangers to the individuals and others. It may be a good idea to make adaptations in the home to prevent falls [get rid of slidding rugs]. Getting up slowly may alleviate the problem; that is .... sit up for about 15 seconds so the blood is rerouted to the brain and then get up. People should also take care when looking upward and not make sudden changes in head position. Symptoms of vertigo are rarely caused by a serious, life-threatening condition. Viertigo is probably the most overlooked problem that doctors seem to ignore. This author would speculate that many wrong-way drivers may experience sudden vertigo that confuses them to turn into the wrong way street. But, you should visit your doctor immediately or seek emergency medical care if you experience dizziness.